You have agreed to surgery for your back problem. The extent, complications and outcomes have been addressed by your specialist. The following information will be helpful in preparing for your surgical procedure. Have you informed your specialist of any other conditions and medications including dosages that you are taking? If not, please do and do not forget to have this information at pre-admission and when you are seen by the anaesthetist. Please note that the use of blood-thinning medication is dangerous if not stopped in time before surgery due to the decreased clotting that blood-thinning medication causes. This can lead to uncontrollable bleeding during surgery. It is important to stop taking aspirin at least ten days prior to surgery. If you are taking Warfarin, this should be stopped according to instructions from your specialist or anaesthetist. If you are taking other chronic medication it is important that you check with your specialist whether you should be taking these on the morning of surgery or not. Please notify the staff if you have had any cardiac surgery, have a pace maker, are a diabetic, have allergies or previous unnatural reactions to medications or suffer from any infective diseases. Make sure that you understand when exactly you should stop eating and plan your trip to the hospital so that you do not have to rush to the hospital on the day of admission. Wear comfortable clothes and slip-on shoes and pack sleepwear and toiletries. Leave valuables at home, but your hearing apparatus, spectacles and dentures should be taken along. You will be allocated a time slot on the theatre list and this is usually an indication of what time you can expect to go to theatre. There are several practical and technical reasons why your operation time slot may be changed. Sometimes an emergency case will cause a long delay and your operation might even have to be cancelled. This is, however, not the norm. At some stage following your admission, the nursing staff will notify you when it is time for you to go to theatre. You will be taken to theatre on your bed and will normally wait for a short while in a waiting area. You will then be moved into the theatre. The anaesthetist will put up a drip to allow the anaesthetic agents to be administered. It is typical that the medication will cause a burning feeling in your arm as you are put to sleep. This is normal and will quickly pass. All vital signs (heart rate, blood pressure, breathing, oxygen concentration of the blood and many more parameters) will be measured for the full duration of your operation. The number of parameters that are monitored is dependent on your physical condition and whether you have certain risk factors. Please see the specific chapters on procedures and operations for technical data about the operation that your specialist is suggesting. It may be necessary to have a blood transfusion during your operation. Whether a blood transfusion is administered depends on the amount of blood-loss during the operation as well as your physical condition and age. If a blood transfusion is considered, a sample of your blood will be taken and sent away to the blood transfusion service where rigorous tests will be performed to ensure that the correct type of blood is issued. There may be technology available to salvage your own blood during the procedure and to re-transfuse it via a drip into your veins. It is also possible in elective surgery to donate your own blood some time in advance if it is thought that the procedure will cause large amounts of blood-loss. A drainage pipe will usually be placed in the wound at the end of the operation and connected to a reservoir and the wound will be closed. This will allow all excess blood to drain away. Following the operation, you will be taken to the recovery room to recover from your anaesthetic. In the recovery room you may have an oxygen mask on your face. Do not be alarmed and try and be as relaxed as possible. You will have a catheter in your bladder and this may make the bladder feel uncomfortable. Do not worry, your bladder should not be full and urine will flow automatically into a drainage bag. Following your stay in the recovery room you will be moved to the ward and the nursing staff will monitor your recovery, assist with your rehabilitation and administer analgesia for any discomfort that you may experience. What are the possible complications of the operation? We do not expect to encounter any complications. Spinal surgery is, however, not risk free and you have to be sure that you understand the more well-known complications. It is important to realise that it is impossible to fully describe all possible complications of surgery. The following are the most well-recognised complications. Risk: There is a risk that the pain, pins and needles or weakness that you currently experience, might not improve immediately following surgery, or in rare cases, never. Explanation: If the nerve compression had been too severe or too prolonged, it may be irreversible. Nerves can be unforgiving and may lose part of, or complete function. In some cases these symptoms can take some time to improve. Risk: There is a chance of wound infection that might require antibiotic treatment and in some cases a second operation. In very rare cases, infection might spread and become so severe that it may cause death. Explanation: Even with the most advanced modern antiseptic techniques, infection can occur. This is the case particularly in patients who have depressed immunity as is seen in diabetics, smokers, HIV positive patients and patients on long term steroid use and any other immunosuppressant drugs. Risk: There is always a risk of bleeding in any surgery. This may happen during or following surgery. This may lead to compression or damage to nerves in the period directly following the operation. Severe bleeding during the operation might require a blood transfusion, but this is rare. In extreme cases it may lead to death. Bleeding may also cause a swelling under the skin and if very large and painful, or compressing vital structures, it may be necessary to drain this blood clot with a minor surgical procedure. Explanation: During surgery, all the bleeding arteries are closed with an electric cautery. These blood vessels may, however, open up again and start bleeding. If the blood clot grows large it may compress important structures like nerves and can lead to nerve dysfunction. The specialist will inspect the wound carefully before the wound is closed and even the smallest bleeding point is stopped. Risk: During surgery there is a risk of damage to the nerves or spinal cord which can lead to weakness or paralysis. It can also lead to loss of sensation and other nerve controlled functions including the bowel, sexual and bladder function. This may be temporary or permanent. This is a very rare complication. Explanation: The spinal cord and the nerve roots that are attached to them are directly in the area where the surgery is performed. Direct pressure on these structures by surgical instruments or blood clots can cause damage. Sharp instruments can damage nerves permanently. You may need an MRI scan (see the chapter Tests and Scans) if your specialist deems it necessary to assess significant complications. Risk: There is a risk that the bony fusion which is part of some of the spinal procedures will not grow, leading to follow-up surgery to support the fusion. If you are a smoker or use steroids or Warfarin, there is a definite risk that the bony fusion will not grow. It is imperative that you stop smoking before a spinal fusion operation. Explanation: The aim of some of the operations is to remove the disc between the two vertebral bodies and to induce a fusion to form between the two vertebrae. 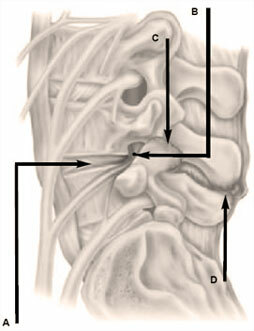 This is facilitated by placing bone between the two vertebrae. In smokers and patients taking certain medications such as Warfarin, steroids, anti-inflammatory drugs and certain other drugs, the bone does not grow as well and causes non-union of the fusion. Make sure that you take only the medication prescribed by your specialist following your procedure. Risk: There is a risk that you might develop a blood clot in the veins of your legs, called a deep venous thrombosis (DVT). This thrombosis can spread to the lungs and heart and can cause death. Explanation: This is a risk in all lengthy operations and prolonged bedrest. This is because of sluggish flow of blood in the veins. The risk can be lowered by applying compressive stockings as well as foot pumps that keep the blood flowing. It is also important that you should get up and move around as soon as you are allowed. Passive leg exercises while in bed should be explained to you by your physiotherapist. Risk: Although it is extremely rare, there is a risk that you may die during surgery because of an anaesthetic complication. Due to modern techniques this risk is now less than 1/10 000. Explanation: Unexpected events can take place during or after operations. This can include reactions to medications, a heart attack, a stroke, kidney failure, lung failure, blood clots in the legs or severe infections. Each one of these conditions will require further treatment and rarely these are serious enough to lead to death. Risk: It is possible that the instrumentation that is used during an operation may dislodge, move or fail. Explanation: Instrumentation and prosthesis used in spinal surgery are foreign bodies and are used to correct the alignment of the spine and to allow a bony fusion to occur. In some cases this instrumentation may fail (break), move or dislodge and can compress sensitive tissue, necessitating removal or replacement of this instrumentation. Risk: It is possible that fusing a segment of the lumbar spine, may lead to accelerated wear and tear at the adjacent segments of the spine leading to further spinal surgery. Explanation: The biomechanical properties of the segment of the spine that is being fused changes and becomes less mobile. This may cause a lever action on the adjacent segments that is thought to accelerate the wear and tear at the adjacent segments. In an attempt to overcome this, it is possible in selected cases to remove the disc that is causing nerve compression and replace it with an artificial disc rather than performing a fusion (see the chapter Lumbar Total Disc Arthroplasty). Risk: It is possible that a major blood vessel may be damaged during surgery. Explanation: In anterior (from the front) surgical approaches to lumbar surgery, some of the major blood vessels may be damaged. These complications rates vary according to the type of surgery and many technical factors. This may be a very serious complication and may even lead to the death of the patient. You would normally be discharged between two days and one week after surgery, depending on the type of surgery. Staff at the hospital can assist in taking care of your follow-up consultation, analgesics to take home, sick leave-certificate and wound care provisions in the post-operative period. It is incredibly important to get a lot of rest and exercise following your surgery. Do not try to rush back to work. It is important to walk for exercise and also exercise in conjunction with the guidelines from your physiotherapist. You may perform activities only as prescribed by your specialist. You should refrain from exercises that involve impact for at least three months. This would include jogging, mountain biking and equestrian pursuits.